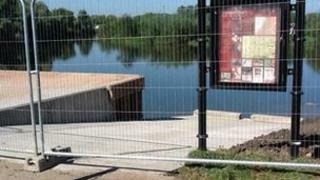 A slipway giving rescue crews access to the River Severn in Tewkesbury has been handed over to the emergency services. The controversial slipway, which was the subject of a public inquiry because of its position on a village green, has taken five weeks to build. Gloucestershire Fire and Rescue Service (GFRS) said it would improve river response times by up to 20 minutes. Planning permission was first sought eight years ago but residents complained, leading to an inquiry. They feared the slipway would ruin the character of the village green close to Healings Mill. Despite local opposition, the Department for Environment, Food and Rural Affairs (Defra) ruled in favour of the plans and allowed the application to go through. GFRS is now expecting the slipway to be in operation by the end of the month. Assistant chief fire officer Geoff Sallis said the service had never had direct access into the river in that area. "We've always had to go through one of the locks and that's a 20-minute delay, so imagine if you're in trouble in the water, 20 minutes on top of our response time is a bit of a nightmare."